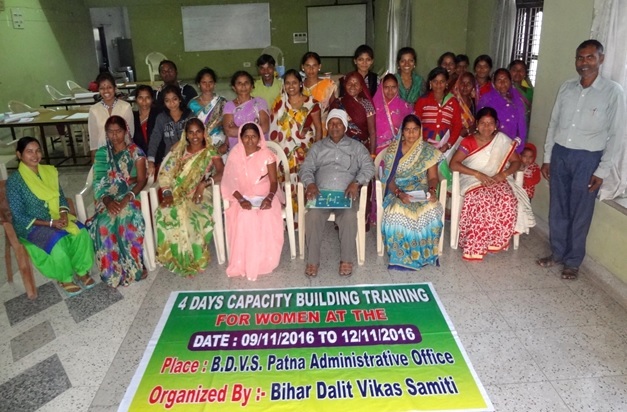 In a novel move aimed at providing a platform for scheduled cast women to enhance their involvement in local governance and building their capacity in the sector of accessing and availing government welfare schemes/ facilities, Bihar Dalit Vikas Samiti organized a capacity building training on government welfare schemes. The training period was date on 09th Nov to 12th Nov 2016 at BDVS administrative office Patna. At 25 scheduled cast women leaders from 5 different districts had actively participated. The initiative was praise worthy because government has lots of welfare plans for the schedule cast people but due to lack of awareness and improper information/ knowledge SC people are far away from accessing those facilities. While addressing the congregation Mr. Pankaj Das a government officer told that people should know and try to know the realities of government intensions. People should co-operate government and help to accelerate the availing process. However he tried to give a good understanding of at least 10 welfare schemes that includes pension schemes, housing schemes, sanitation and construction schemes. Women were too much eager to know the exact process of getting the facilities. This program was imparted to 25 SC women leaders but that reaches to at least 1000 sc women. The training method was lecture, group discussion, presentation and use of audio visual aids. Through this training BDVS expects some developmental changes among SC women in accessing welfare facilities.